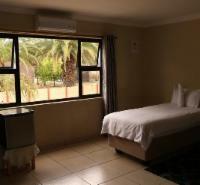 Pelican Guesthouse is a great choice when in Windhoek as there are various room options to suite every kind of traveller. The room options include Double, Single and Family rooms. The Double Rooms accommodate two people and have air-conditioning, Wi-Fi and DStv. The Single Rooms also accommodate two people on single beds. They too have air-conditioning, Wi-Fi, and DStv. The Family Rooms can accommodate four people and have the same amenities as the other rooms. All rooms include breakfast. Dinner and lunch can be served if pre-arranged. All rooms are en-suite for guest's convenience. Windhoek hosts many attractions, some of which are NamibRand Nature Reserve, Karibu Safari, and Namibia Craft Centre. The personnel at the front desk is always willing to provide more information or assist on any trips you may wish to take. Pelican Guesthouse is 2.9km from the centre of Windhoek , the nearest airport 5km (Eros Airport).